♣Easy To Operate : There are 3 buttons. You can press °C/°F to switch from °C to °F. Button MAX/MIN is design for you to check the record of High & Low temperatures & relative humidity. You can also easily reset the MAX/MIN record by pressing theRESET button. Easy to operate and no more confusion. ♣Suit Applications: with humidity and temperature monitoring, the digital room thermometer suits for using at home, office, indoor living room, perfect for baby children use. ♣Power Supply And Way To PlaceE: it is powered by 1*AAA battery(Not included); the clock can be hung on the wall and set on desktop or countertop. 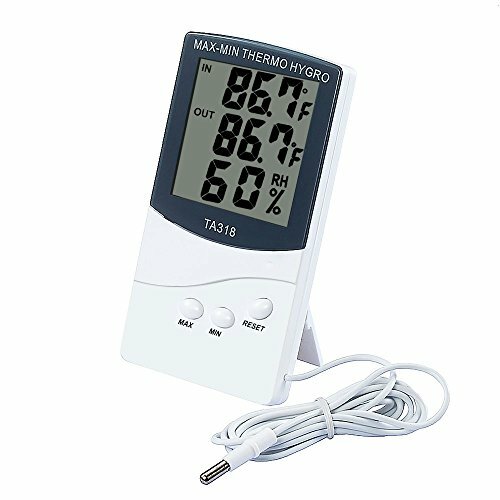 ♣Simple Design : Mini digital thermometer and hygrometer, convenient for you to set such a life partner on your night stand. perfect to be used as car temperature monitor too.